In the last few years, Facebook has emerged to be one of the most popular social media networking sites. In fact, it was Facebook who brought evolution in the world of social media. As it shot to fame, hackers started coming up with ways to hack Facebook ID or Facebook password. 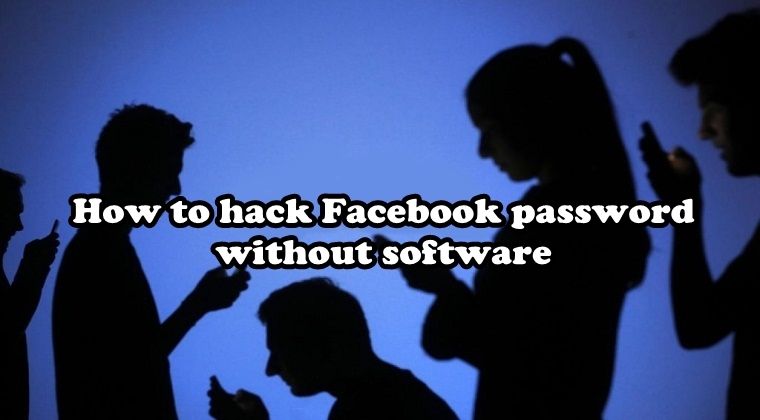 In this post, we will be enlightening you about how to hack Facebook password without software. Despite Facebook offering effective security measures, hackers are still inventing new techniques to hack Facebook accounts and Facebook passwords. These effective security measures have helped Facebook gain their users' trust time and again but still hackers are putting a tough job for the social media giant. What comes as a surprise is that the hackers are trying to hack Facebook without seeking help from any software or program. In fact, they are using conventional hacking techniques to gain someone's Facebook password. If you want to know the answer to the question, 'how to hack Facebook password without software' then we suggest you continue reading this post. Hackers can use different techniques to hack Facebook password without using any software or program. Some of the most widely used techniques include phishing. In this technique, hackers create a webpage which looks similar to the Facebook's login page. They upload this similar looking web page to a hosting whose domain name is similar to that of Facebook's. After that, they send this link to users in a personal message, asking them to log in to their Facebook account. Once a user is tricked into believing that they are logging in to their Facebook account, the hackers can easily gain their email ID as well as the password as soon as the user is logged in. The other Facebook hacking technique hackers commonly use is resetting your Facebook password. People close to you such as your best friends, relatives, or even colleagues can try gaining access to your Facebook ID using this method. Since they are close to you, they might have an idea of your password or may open your laptop and reach the saved Facebook account or email ID attached to that account. If your Gmail account is already logged in your laptop, the hacker can easily hack your Facebook in just a few minutes. In case you have used your mobile number as your Facebook ID then the hacker can simply ask for the code using your own mobile phone and then delete the text after gaining access to your Facebook account. Similarly, the hackers can also hack your Facebook account using other techniques such as social engineering and plain password grabbing trick. On the other hand, they can also make use of monitoring apps like Mobistealth to gain access to your Facebook account and monitor all your Facebook activity very closely. What most hackers fail to realize that they can also have access to someone's Facebook account or their entire Facebook activity using a monitoring tool. When we speak of a monitoring tool, then keep in mind we will only be recommending the credible and authentic Facebook hack tools on the internet but this is the most genuine one that you can use it. One such example of an authentic monitoring tool is Mobistealth. Though it's an advanced monitoring solution, offering an extensive set of surveillance features for your digital devices, it can also be used to keep a track of someone's Facebook activity. You just need to download and install this monitoring solution, either its computer software or mobile app, on your target's device whose Facebook you wish to monitor, and then let the tool do its job. As soon as the monitoring tool is deployed on the target's device, it will record all their Facebook activity and send the information to your online Mobistealth account, enabling you to remotely monitor their activity. Though hackers can try different methods to hack someone's Facebook password we would strongly suggest them try the monitoring tool as it has been regarded as the safest method to carry out the Facebook hack.